If you're a blogger promoting unique and fun DIY projects to your visitors, we have the perfect program for you. Etsy Studio will allow you to discover interesting, unusual craft supplies from real people all over the world. Join the program today to start earning 4% commission on all sales while inspiring others with your how-to's and tutorials. Sit down, dream up, and keep making. 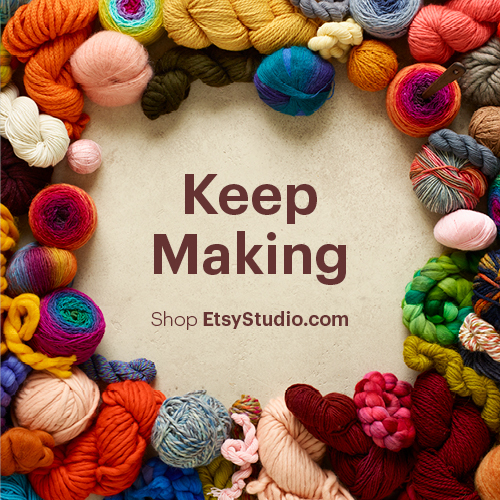 Etsy Studio is a brand new global market that inspires making. Find craft supplies and creative DIYs, all in one place. How is Etsy Studio different from Etsy? Etsy created Etsy Studio, but it’s a totally separate website and market, devoted wholly to craft supplies—handmade, vintage, or commercial. And Etsy Studio has something more: craft project ideas. Each one has step-by-step instructions, with links to purchase everything you need to complete the project. Why join the Etsy Studio Program? If there is anything else you’d like to know about the Etsy Studio affiliate program or to discuss partnership opportunities then please do get in touch with our friendly team at us-affiliates@etsystudio.com.